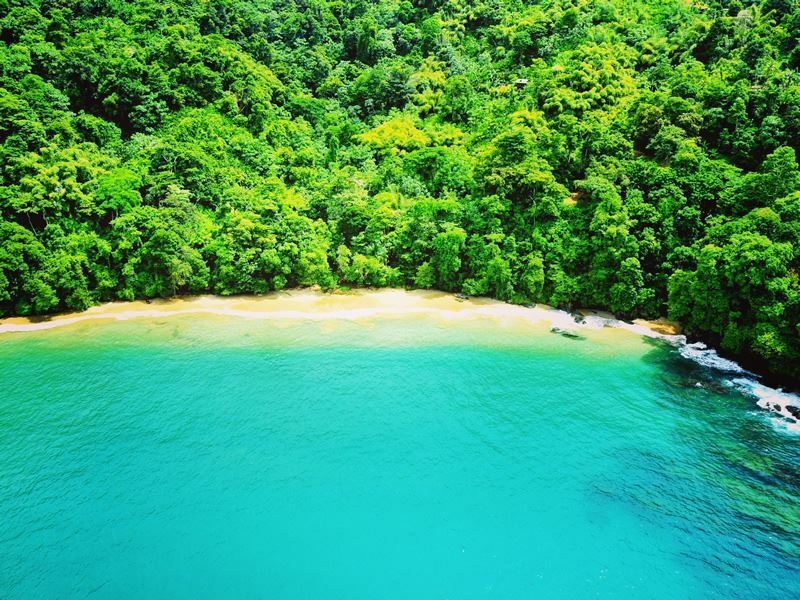 The smaller sibling of Trinidad holds much in store for those seeking rest and recuperation with plenty of opportunities to dive into both the warm ocean waves and one of the western world's first ever protected forest areas, the Tobago Forest Reserve. As the island is fairly hilly thanks to experiencing its fair share of volcanic activity you'll find no end of chances to spend your days outdoors and as Tobago is around 25 miles long and just over 5 miles wide, there are enough wide open spaces for everyone to enjoy. Literary buffs maybe interested to learn that Tobago was once considered to be the inspiration for Robinson Crusoe however, one fact that's definitely not to be refuted is that this was the setting for Disney's Swiss Family Robinson so you're bound to already have a slight inkling as to what's in-store. Day trips off the island to both Trinidad and smaller islands, such as Little Tobago and St. Giles, are highly recommended and anyone who knows their Dusky-backed shearwaters from their Red-tailed tropicbirds may well want to pack a pair of binoculars. Another animal that is definitely worth a mention has to be the Leatherback turtle which makes the sun-kissed beaches of Tobago its nesting grounds from late spring to around mid-summer. Choosing to visit the island around nesting season is a great idea if you're travelling with the kids or just fancy watching or helping to preserve a truly remarkable natural spectacle. Of course, the sands of Tobago aren't just for turtles and you'll quickly discover why coconut tree gardens, calm ocean waves and innumerate butterflies and colourful birds make the perfect accompaniment to what is an undeniable glimpse at a tropical paradise. Beaches are very well-maintained and go on for miles so after a stroll along the shore you'll be more than ready to quench your thirst at the closest bar or street vendor. Flavoured snow cones, slushy or jellied coconuts and rum cocktails are everywhere, as are fresh fruit sellers, so there are no excuses for not being able to keep cool no matter what the time of day. If you overdo it on the rum punch then it's thought that the local souse (seasoned meat) is the best cure for a hang-over but: fried bake, tomatoes and salt fish is probably equally as effective so make sure you take your time and find the right balance of food, sunshine and booze which works for you. Tobago really is as good as it sounds and if you're looking to learn about a few of the other activities and locations that you'll find when you arrive then check out the top 10 things to do in Tobago below and don't forget your flip-flops. A slightly contentious claim to fame for Tobago is that it was the setting for Daniel Defoe's novel Robinson Crusoe and no visit to the island is complete without checking out the legendary cave that may or may not have been the home to Defoe's stranded hero. Located at Crown Tip on the southwest coastline, behind the international airport, this is a fairly innocuous looking rocky dwelling in the side of a cliff face and a small fee will get you up close against a backdrop of waves and spray. Probably good not to get too over excited however, a great chance to explore and search for your own personal patch of desert island. Thanks to Tobago's variety of gradients you'll find a criss-cross of trails and tracks that are well-suited to mountain bikers. Renting the kit couldn't be easier and either following a guide or undertaking your own tour will get you out and about in no time at all. 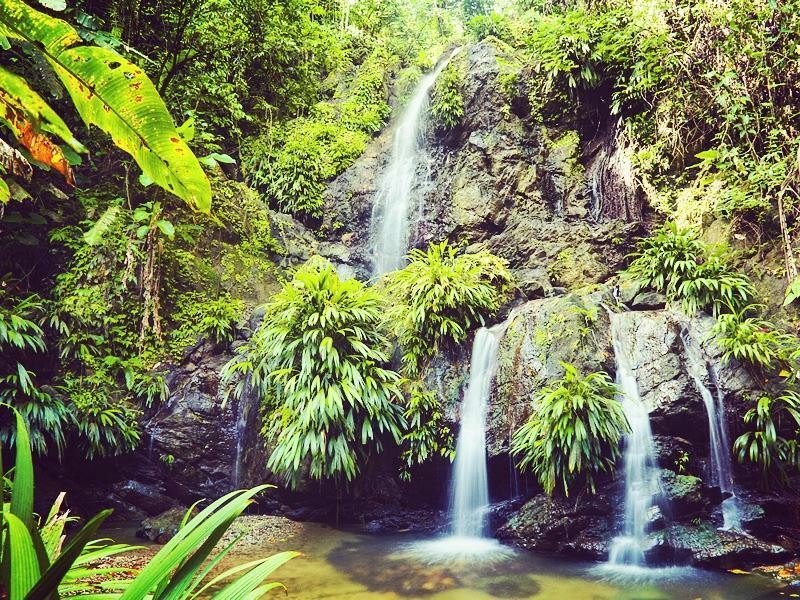 Waterfalls, beaches and ruined fortresses all make for excellent locations to head to once in the saddle however, it's often the cries of birds and the captivating forest canopy that make mountain biking in Tobago an absolutely awesome experience. Top local tracks include: Indian Walk, Wild Cow Trace, Sky Loops and Chocolate Cake - get out there and ride them all. Attention race goers: if you're hoping to catch the annual island goat race for which Tobago holds international acclaim then head over to the arena around Easter time and prepare to be amazed. I am not kidding (pardon the pun) goat racing in Tobago is big business and every year the island welcomes thousands of visitors all clamouring to see which animals will come in first over a series of different race categories. Although the goats aren't ridden they do have a handler who will run alongside them and ensure that their goat is the fastest whilst also finishing in front of their goat to avoid disqualification. Great fun at Buccoo village on the southwest coast. 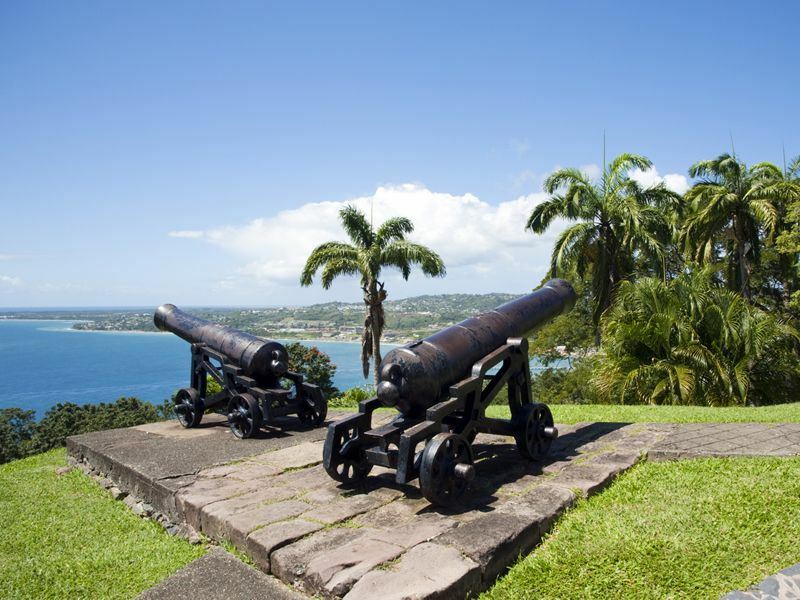 Ever since Chris Columbus clapped eyes on Tobago, the island has been the subject of numerous battles and subsequent invaders with the Dutch, Brits, Spanish and French all laying claim to the land at one point or another. Although Trinidad and Tobago have been independent from the UK since the 60's many of the forts and ancient buildings can still be seen to this day to help interested visitors to piece together the island's colonial and indigenous heritage. Forts, such as: Granby, King George, James, Bennett and Milford, are scattered around the coastline and are all well-worth a visit even if you're not overly excited about history. If battlements aren't your thing or your looking to add more to your cultural tour then the Mystery Tombstone, Arnos Vale waterwheel and the Speyside waterwheel are also heritage highlights that are well worth at least a few moments of your time. It's going to be tricky to top a day at the beach in Tobago however, if you're into your plush green fairways and pearl white bunkers then a trip to the local golf course may just push its way to the top of your list of things to do. The 18-hole course at Magdelana, in particular, is an absolute sight for sore eyes and as this one time coconut plantation boasts an impressive par 72 you may well want to visit a few more times just to make sure you get the lay of the land. Not many other locations where you'll find mangroves, beaches and woodland to put you through your paces and with some of the island's most prestigious ocean views you probably won't have much trouble finding a friend to caddy for you. Cascading down some 175 feet, the Argyle waterfalls on Tobago's east coast are the tallest and most impressive on the island and if you're looking for a place to relax and catch your thoughts then this is certainly up there with the best of them. You'll find plenty of guided tour offers from the chaps who tend to congregate around the car park entrance on Windward Rd however, make sure you check for an official falls badge first prior to parting with any cash. The actual falls are a short walk from the car park and don't forget your togs and towels as there are plenty of deep pools that are ideal for a swim or just to soak your toes. As big sisters go, Trinidad is pretty cool and taking the two and a half hour ferry journey from Scarborough to Port of Spain is well-worth the return ticket price (about £10). Once arriving in the capital of Trinidad & Tobago, you'll find a huge range of shopping, museum, clubbing and eating options so make sure you plan your day and night accordingly. One of the best times of the year to head over to Trinidad is for the annual carnival which takes place early to mid-February or, in some cases, early March to coincide with the day before Ash Wednesday. This is just an explosion of colourful costumes, naked flesh and good times with parties and calypso tunes lasting long into the warm Caribbean night. There's no getting away from the beaches of Tobago and as you'll find as soon as you arrive, searching for your own perfect piece of sandy paradise is often cited as one of the best things to do whilst on the island. Englishman’s Bay (mid-west coast), Pigeon Point (southwest tip) and Castara Bay (mid-west coast) are all up there with some of the best beaches on the planet and if you're looking for picture postcards to make the folks back home green with envy then you'll be spoiled for choice. Seafood cafés, lush green foliage and mile upon mile of golden sand make the beaches of Tobago an awesome prospect and try as you might, there's simply no better place to relax, catch a tan and watch the world slowly drift by. Boasting over 200 different species of bird and no end of tropical habitat from where to see the feathered critters in their element, Tobago is fast becoming one of the hottest spots for twitchers this side of Lowestoft. Even if you've never even picked up a pair of binoculars before this is a great location to start and before long you'll be eagerly quivering with delight as you spot a multi-coloured plumage appearing from amongst the emerald green rainforest canopy. 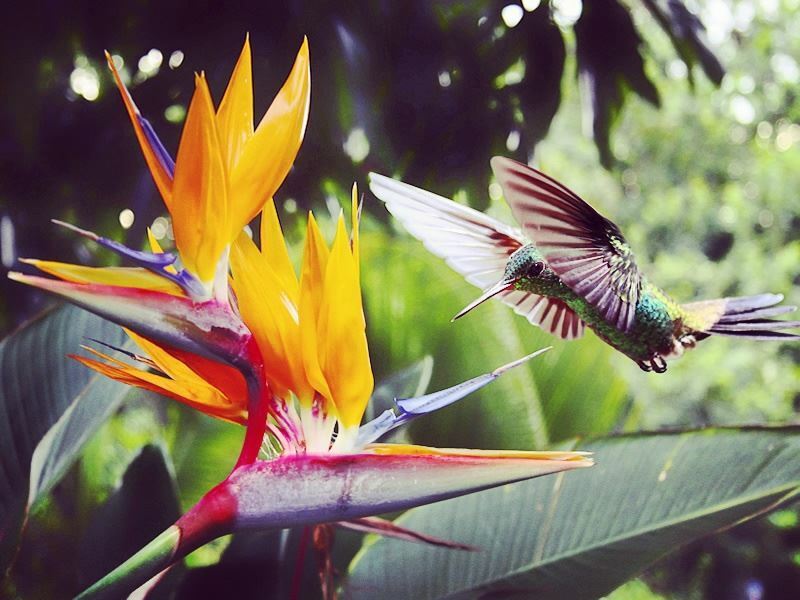 Honeycreepers, woodpeckers, blue-backed manakins and sabrewings can all be found dotted throughout the island however, it's the Tobago Forest Reserve (possibly the oldest of its kind in the west) where you'll discover the lion's share of bird action. Whatever level of dive experience you have one thing is for sure, getting underwater in Tobago is going to fulfil pretty much all of your wildest dreams as from shimmering tropical fish to verdant coral reefs, this is an awesome place way to spend your time in the Caribbean. 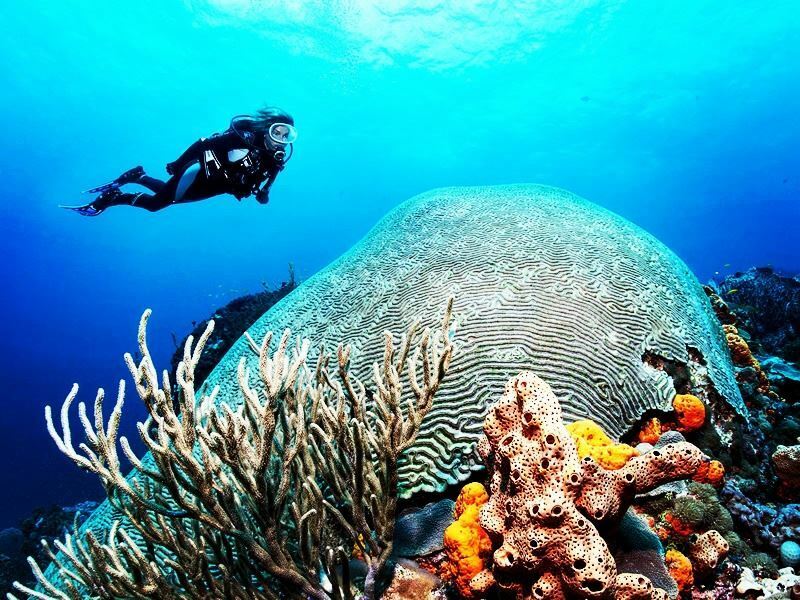 With over 50 locations considered to be fully established dive sites, Tobago is quite rightly up there as a diver's dream destination and as such you'll find no end of PADI schools and organised tours to help you get to grips with life underwater. Snorkelling is another great means of getting into the water especially if you don't have the time or the inclination to take a SCUBA course with the shallows of Buccoo Reef and nearby Nylon Pool, off Pigeon Point, always proving popular grounds for the mask and flippers brigade.